Howls Of Winter IV will take place at Rockclub Tapper in Tallinn, Estonia on February 16-18, 2017. Urfaust, Horna and Dordeduh are among the bands that will perform at Howls Of Winter IV festival. Barther Metal Open Air will take place in Barth, Germany on August 13-15, 2015. 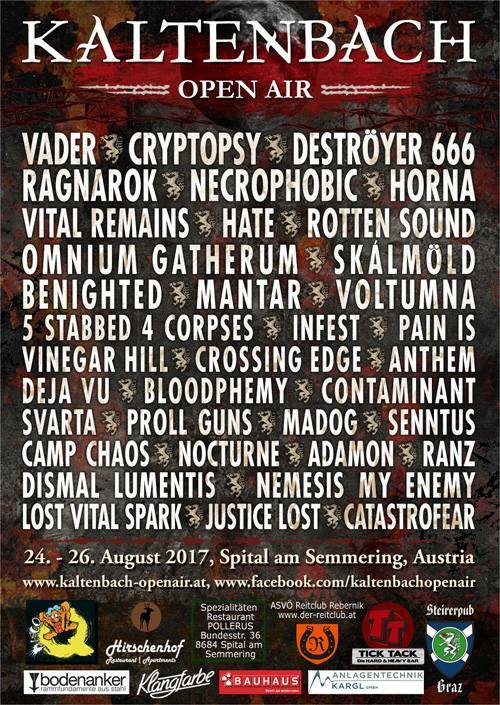 Gehenna, Agalloch and Endstille are among the bands that will perform at the Barther Metal Open Air festival. Kilkim Žaibu Festival will take place in Varniai, Lithuania on June 21-23, 2013. Destruction, Turisas and Exhumed are among the bands that will perform at the Kilkim Žaibu Festival 2013 festival. SteelFest Open Air will take place at Villa Factory in Hyvinkää, Finland on May 24-25, 2013. Mayhem, Sodom and Destruction are among the bands that will perform at the SteelFest Open Air 2013 festival. Darkness Rising will take place in Belgrade, Serbia on May 30 – June 01, 2013. Enthroned, Horna and Desaster are among the bands that will perform at the Darkness Rising 2013 festival. Morbid Angel, Napalm Death and Nasum are among the bands that will perform at Maryland Deathfest 2012 festival. Metal Mania Open Air will take place in Komen na Krasu, Slovenia on August 13-14, 2011. Destruction, Entombed and WizardMetalsteel are among the bands that will perform at the Metal Mania Open Air festival. Amorphis, Arch Enemy and Napalm Death are among the bands that will perform at the Nummirock Metal Festival in Kauhajoki, Nummijärvi, Finland on June 18-20, 2009.